Aching God was a tricky one for me. Whilst I thoroughly enjoyed the beginning and the last 25% of the book, I was slightly disappointed by what happens in between. The majority of reviews I have read mention the similarities to Dungeons and Dragons. I've never played Dungeon and Dragons which might be one of the reasons I didn't enjoy it as much as most people. 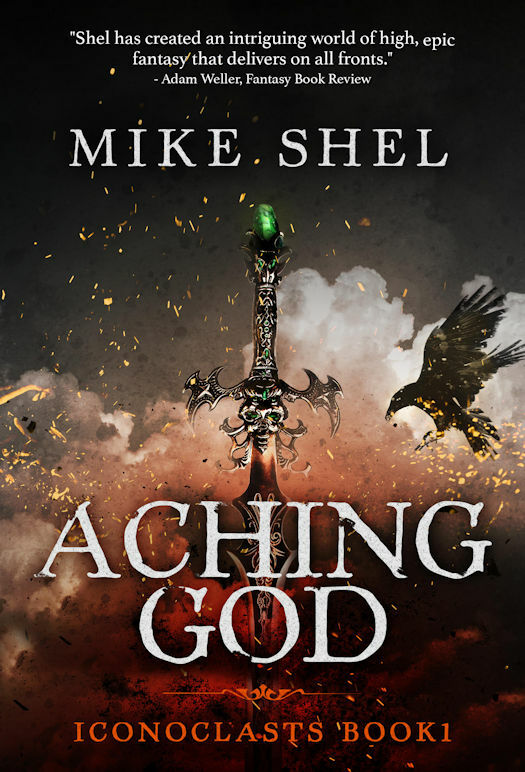 So here's my thoughts on Mike Shel's Aching God. We Follow the thoughts of our main character, Auric Monteo. An old and wise warrior and a former agent of the Syraeic League. Currently living out his retirement in a small village called Daurhim, far from the City's hustle and bustle. That is until he receives a letter from the Syraeic League requesting his counsel on urgent matters that also include the health and wellbeing of his daughter, Agnes. This was probably the most enjoyable part of the book for me. We meet two new characters early on. Belech a former mace-man from the Pearly Regiment and now servant to Lady Hannah, Baroness of Daurhim. And Sira, a priest of Belu, whose also heading to the city. Belech was the only other character apart from Auric, that I really liked. He's an old school solider that's as loyal as they come. He's also not afraid to get his hands dirty when it comes to a scrap. Whilst in the city, Auric is asked to lead a crucial expedition on behalf of the Syraeic league. This mission will see Auric enter a Djao Ruin. something that haunts Auric's Dreams. The mission is to return a Djao artefact believed to be the cause of the chaos that's thundering its way through the Blue Cathedral at Boudun. He accepts this mission purely because he has no other choice. Returning the artefact could save his daughters life. This is around the time we meet the other Syraeic agents who accompany Auric on his dangerous mission. The characters never really sparked my interest. I wouldn't go as far as to say I didn't like them, I just found myself not really caring about them. One of the problems with the characters was the fact they could be healed by the priest, Sira. For me, this took the fire out of any fight scenes. When someone was seriously injured, my first thought was, who cares? They're going to be healed anyway. Its a shame because there were some great battles that would have been that bit more intense. Another issue I had was how long it took to really get into the story. The first 15% was exciting and beautifully written. The Queens Court was beyond intense. I don't think I've read a chapter that fast. The next 60% of the book just failed to charm me the way the first 15% did. I found myself begging for some action and although we see some great fights, I always had that 'well they're going to be healed anyway' thought niggling at that back of my mind. Although this book wasn't my cup of tea, there were a lot of positive parts that I believe will intrigue a lot of readers and that's evidently shown when you consider how far this book has got in the SPFBO competition and the positive feedback its received on sites such as Goodreads. It sounds interesting, although not really my cup of tea, I don't think. It's always disappointing when you pick up a book and the beginning is great, only to discover that the rest of the book isn't going to deliver how you had hoped.